Etiquette – or the ways in which individuals interact with each other in a polite, courteous manner – can be thought of as the buffer space that allows individuals to relate to each other, collaborate with each other and do business together with as little friction as possible. In the business world, proper etiquette is crucial to ensure that transactions, agreements and meetings go smoothly and end in success. A lack of business etiquette can do more than cause hurt feelings or leave a negative impression. It can also damage your career and your business. Good business etiquette helps improve communications and ensure business success, on both a company-wide and a personal level. A lack of understanding of etiquette expectations can result in misunderstandings and unintended offenses. It’s important to define business etiquette, as well as the circumstances in which it varies. Put simply, business etiquette refers to the collective rules, customs and expectations governing social and business interactions. Business etiquette is concerned strictly with those customs and expectations in the context of business and is more than simply saying please or thank you. It encompasses the way you behave with another person throughout all business interactions. Etiquette applies to all sorts of events and exchanges, including emails, telephone calls and shared meals. The importance of business etiquette is clearly demonstrated when two people from different cultures interact with each other for business purposes for the first time. Cultural and societal norms can vary widely from country to country. What is expected or considered good etiquette in one country can prove offensive in another. 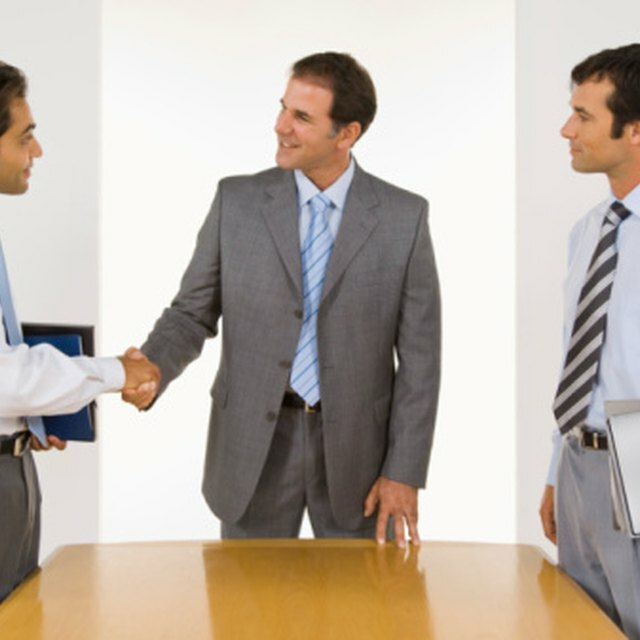 For example, an interaction as simple and straightforward as a handshake can cause unnecessary trouble. In many countries, including the United States, a firm handshake is the ideal. However, a firm handshake may be looked down upon in France, where light handshakes are expected. In the same vein, handing a new contact a business card is an informal, perhaps even automatic gesture in much of the world. Yet in many countries, cards are handled with far more respect and formality. And whereas informal conversation is expected in Brazil, it may be frowned upon in Russia. Making an etiquette blunder may not cause significant damage, but such errors do present a lost opportunity. When it’s so easy to do a little research and prepare for such an encounter, it’s easy to distinguish yourself and your company by demonstrating knowledge of the cultural norms of the other party. It shows that person you care enough to make them feel at ease, which goes a long way toward creating a favorable impression. In addition to creating a positive first impression on both corporate and individual levels, good business etiquette helps instill confidence in others, which in turn increases the sense of trust they will have. It also reduces anxiety, which can interfere with an otherwise solid work performance. Good etiquette doesn’t just apply to interactions with strangers or colleagues from other companies. It also creates better and more harmonious relationships with coworkers. By maintaining a focus on respect and consideration, good business etiquette helps companies foster a stronger sense of connection and teamwork. Finally, good business etiquette is simply good for business. Exhibiting comfort in business meetings, communications and other interactions opens up doors, both individually and for your company. People with strong interpersonal skills are highly prized and respected in most business cultures. Providing training in business etiquette can prove profitable for businesses, especially ones that do business in other countries. By creating a better first impression of its employees, a business can improve its own reputation among competitors, colleagues and prospective customers. Training in business etiquette takes a number of forms. Consultants and experts can conduct short on-site training sessions for employees. Additionally, several training firms offer online classes and webinars that employees can watch as schedules permit. Books, pamphlets, video courses and even off-site workshops are also available. Providing a range of options helps employees choose the method that most closely suits their individual learning styles.